Happy New Year everyone! Glad the holidays are over, and now I can think about what I would like to bring into my life for 2012. The year was off to a rough start with a very bad sinus infection/cold. No fun. On the mend, and this Sunday I will be hosting my first vision board party, with a two of my new friends in St. Louis. I got the vision board party idea from Louise Gale. Thanks Louise! I haven't done a vision board in years, and feel it's just what I need to help ground and focus me. Needless to say just feel like I am free floating, which does not sit well with me. Loving this painting that I did last month. I got the french label from Marisa of Creative Thursday, when I attended one of her workshops at Squam of fall '10. It was a great class on book making, and Marisa was kind enough to share some of her paper scraps. 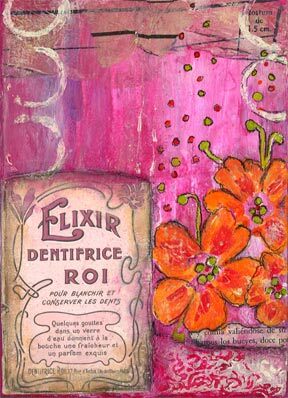 Think I want create more paintings with the french label theme.